Are you looking for camping food ideas? I have lots! I'll be honest with you: one of my favorite things about camping is eating! I don't want to spend my camping vacation cooking or cleaning up! Wait - there's another problem - I don't want to go home packing any extra pounds from all that eating, either! Fortunately, I don't have to worry about either of those problems! Over the years, I have collected lots of camping food ideas that are delicious, easy to make, and healthy, too! 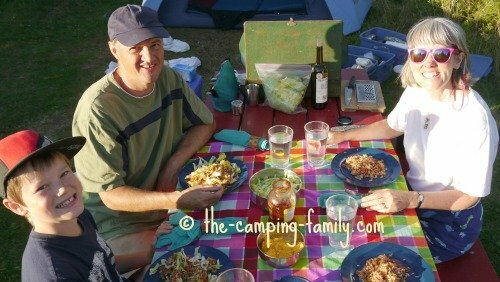 I'm delighted to share my camping food ideas with you. If a food idea on this page is written in bold print, you'll find a photo of it on the right. Click on the photo for the recipe. I love planning camping meals! To learn about my complete camping food system - including menu planning, shopping, packing, cooking, and saving time - click here. Lunch is an informal affair when we go camping. I like to put a variety of options on the picnic table and let the hungry campers help themselves! Choose a few of these lunch camping food ideas for each meal. These are my favorites! 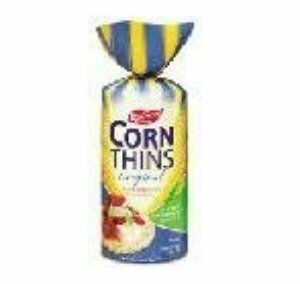 They are sturdy, thin and crunchy, and they taste like popcorn! They're delicious spread with peanut butter, hummus, or cream cheese. You can also dip them into soup or crumble them onto a salad. Try spreading a corn cake with refried beans, and topping with cheese and salsa. They keep fresh for ages if you seal the bag tightly - and they are gluten- and GMO-free! We eat a lot of these! Not interested in making hummus from scratch? This mix is for you! 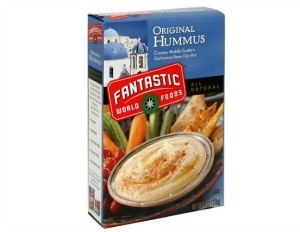 Just add water and a bit of olive oil, and you have a delicious spread for crackers or veggies that is tastier and cheaper than buying ready-made hummus. My favorite salads are hearty enough to be a meal in themselves! They are nice for dinner on a hot day, too. These BPA-free containers are perfect for salads because they have air-tight lids that stay on securely. The 22 cup size is great for a big batch of salad. 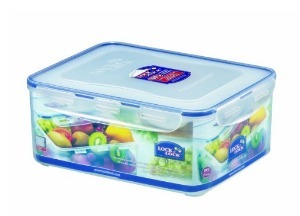 The 304 ounce size is perfect for carrying your fruits and vegetables. Look for sturdy fruits that pack well. Stay away from soft fruits like bananas and kiwis. They will get crushed in the food box. Sardines are a perfect snack for camping or hiking. They are high in protein, portable, and easy to eat. 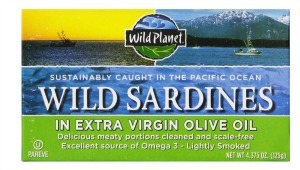 These sardines were caught in a sustainable manner along the coastline of California. Tired of dealing with the melted ice at the bottom of the cooler? Visit this page to learn about a wonderful alternative: camping refrigerators! I love the convenience of one-pot meals! And I love that there is only one pot to wash! Serve angelhair pasta with butter, garlic and freshly grated Parmesan. Make Pasta with Marinated Artichoke Hearts. Top linguine with pesto sauce. 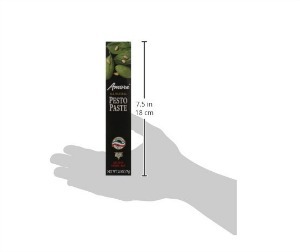 Pesto sauce in a tube?! What a great idea for camping or hiking! Use just as much as you need and save the rest for next time! This all-natural variety contains only basil, sunflower and olive oils, salt, pine nuts, garlic and citric acid. Steamed Citrus Fish is an easy and tasty way to serve fish fillets. Balsamic-Maple Chops are very easy and surprisingly quick. Mexican Skillet Supper is a tasty way to eat ground beef and rice. Ground Beef and Potatoes is filling and delicious. A Tinfoil Dinner filled with tasty ingredients and cooked in the coals of your campfire is a classic camping meal. You need a Dutch oven to make Ham and Cheese Gratin, Dutch Oven Pizza or Layered Bacon, Potato and Cheese Supper. Click here to learn about cooking with a Dutch oven. A potato baked in the coals is one of my favorite foods ever! Hamburgers cooked on a grill over the fire are a special treat. Hot dogs (or chicken dogs, tofu dogs or veggie dogs) are fun to cook over a campfire. Don't forget the marshmallow roasting sticks - they work just fine for hot dogs too. And don't forget the mustard, relish and ketchup! How about making homemade ice cream with an ice cream maker ball? 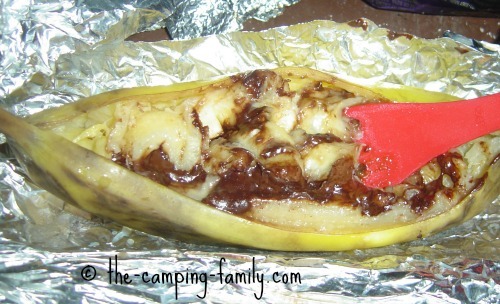 Banana Boats (bananas stuffed with goodies, wrapped in foil, and cooked over the fire) are easy and tasty. Smores are a traditional - and delicious! - campfire dessert. Trail mix is the perfect camping snack. Homemade granola bars are healthier and tastier than store-bought! Campfire Cones are fun to make and great to eat. Don't forget the coffee, tea and hot chocolate! Of course, water is the most healthy and refreshing drink there is. Most campgrounds provide water that is safe to drink, but it doesn't always taste good. I always pack some lemon juice or lime juice. If the water at our campground doesn't taste great, a squirt of juice mixed with the water solves the problem. Besides, a glass of water with lemon on a hot day is very refreshing! Here's a convenient way to flavor your water! 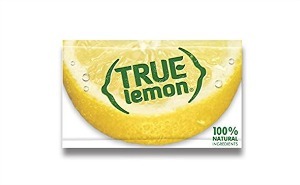 Each packet holds just enough 100% lemon juice to flavor one glass. Going backpacking presents a whole new challenge! Your food can't be heavy. Drying your food and then rehydrating it at camp is a great idea. Read about my first attempt at dehydrating food. I made a batch of chili for a hiking trip. It was delicious! Here are some tips for dehydrating meat. My favorite backpacking supper is Cheesy Mexican Chicken. The hardest part about making camping meals is not the cooking - it's the deciding what to make! That's why I made these camping menus. 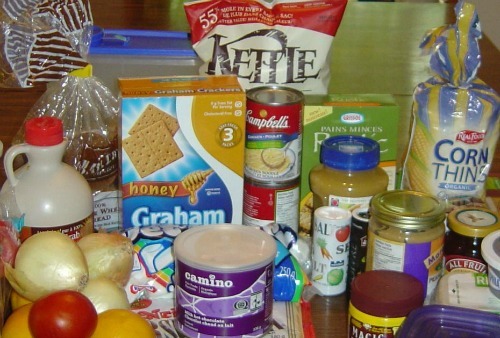 Here's a complete menu and packing list for a weekend camping trip. Are you planning a longer trip? Here are some camping menu ideas for a week-long vacation. If you'd like some help with your camping food list, I have a page for you! Planning and packing the food is one of my favorite parts of a camping trip! It wasn't always that way, though. I used to dread organizing the food. Then I developed a system that makes it easy and enjoyable! Here's my system. What's your favorite camping meal? You can't have too many camping food ideas! I'd love to hear yours! Entering your meal idea is easy to do Just type! Do you have a photo of the dish - or of your family enjoying it? How about a photo of your camp kitchen? Click the button and find the photo on your computer. Select it and click on the button to choose it. For even more camping food ideas, see my camping food list.